Paola Prestini is “the imaginative composer” (The New York Times), “Visionary-In-Chief” (Time Out NY), and Co-founder/Artistic Director behind the Brooklyn venue and music incubator National Sawdust. She was recently named an “Innovator” on the list of Top 30 Professionals of the Year by Musical America, the country’s oldest classical music magazine; she is on Brooklyn Magazine’s latest list of “influencers of Brooklyn culture…in perpetuity” alongside such household names as Chuck Schumer and Spike Lee; she is one of the “Top 35 Female Composers in Classical Music” (The Washington Post); and on the “Top 100 Composers in the World” list by NPR. Prestini’s music and works have been commissioned by and performed at the Brooklyn Academy of Music, The Brooklyn Youth Chorus, the Barbican Centre, The Cannes Film Festival, Carnegie Hall, the Kennedy Center, The Los Angeles Philharmonic, The Los Angeles Opera, The New York Philharmonic, Roomful of Teeth, the Choir of Trinity Wall Street, and the Young People’s Chorus, among others. Since 1999 when she co-founded the multimedia production company VisionIntoArt while at the Juilliard School, (now relaunched as National Sawdust Projects), she has collaborated with poets, filmmakers, conservationists and astrophysicists in large-scale multimedia works (often in collaboration with Beth Morrison Projects). Large scale works in development include works for The Kennedy Center, Minnesota Opera, Atlanta Opera, and Banff’s Opera in the 21st Century. She frequently collaborates with Beth Morrison Projects, and with artists and scientists such as Mark Campbell, Julian Crouch, Helga Davis, William de Buys, Nathan Gunn, Rinde Eckert, Murat Eyuboglu, Mario Livio, Eliza McNitt, Jessica Rivera, Brenda Shaughnessy, Tanya Tagaq, Royce Vavrek, Julian Wachner, Robert Wilson, and Jeffrey Zeigler. Described as "stark" by WNPR, Iranian composer Niloufar Nourbakhsh's music has been commissioned and performed by Symphony Number One, Spark and Echo Project, Women Composers Festival of Hartford, Pianist Erika Dohi for Metropolis Ensemble Piano Series, Calidore and Cassatt String Quartets, and Invoke Quartet at numerous festivals, Atlantic Music Festival, Seal Bay Festival of American Chamber Music, SPLICE institute, New Music for Strings, MusLab electroacoustic festival in Mexico, University of Tennessee Contemporary Festival and more. Nilou is founder of Iranian Female Composers Association and a strong advocate of music education. She has worked as the site coordinator of Brooklyn Middle School Jazz Academy sponsored by Jazz at Lincoln Center. She is currently a Teaching Artist for NY Philharmonic Very Young Composers program. This summer, she will be working with Akropolis Reed Quintet for a new piece as part of I-Park Foundation Artist in Residence. Shelley Washington (b. 1991) writes music to fulfill one calling- to move. With an eclectic palette, Washington tells stories focusing on exploring emotions and intentions by finding their root cause. Using driving, rhythmic riffs paired with indelible melodies, she creates a sound dialogue for the public and personal discourse. 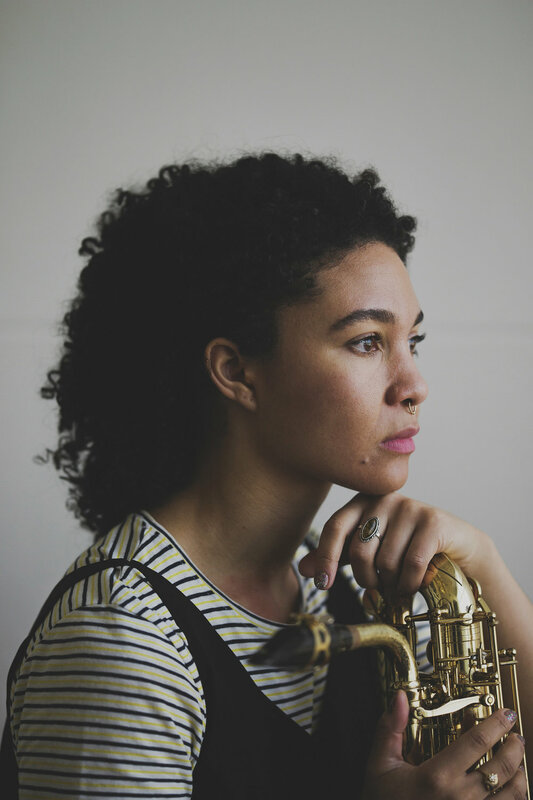 Shelley performs regularly as a vocalist and saxophonist, primarily on baritone saxophone, and has performed and recorded throughout the Midwest and East Coast- anything from Baroque to Screamo. She holds degrees from Truman State University; a BA in Music focusing on saxophone, and a Masters of Arts in Education. She also holds a Masters of Theory and Composition from NYU Steinhardt, where she studied with Dr. Joseph Church, Dr. Julia Wolfe, and Caroline Shaw. As an educator, she currently is Artistic Director for the Noel Pointer Foundation, located in Brooklyn, NY. In Fall of 2018 she will begin attending Princeton University in pursuit of the PhD of Music Composition. Shelley is a founding member of the composer collective, Kinds of Kings.